Pediatric Dentistry: Our New Doctor! APDA is pleased to announce the addition of Dr. Geetha Thirumala to our practice. She is a Pediatric Dentist who has practiced previously in New York City and Cleveland Ohio. Originally from Florida, she went to college at Emory University in Atlanta. She finished dental school at Boston University, completed a General Practice Residency at Montefiore Hospital in New York City and her Pediatric residency at Jacobi Medical Center. We are thrilled to have the first female Pediatric Dentist in our area! Her husband is a cardiac anesthesiologist. She is a mom too, with two very cute little girls. Call, e-mail or come by to make an appointment. 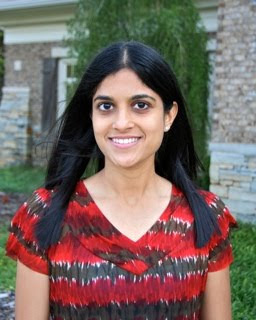 "Dr. Geetha" will be working at our Huntsville and Madison offices. Of course, we still have four other great Pediatric Dentists and two Orthodontists here as well. Hello there Dr. b I have a question that doesn't really have to do with this blog sorry.But I was reading one of your blogs can't for the life of me remember which one.But you mentioned important questions to ask a dentist before choosing one such as is he/she board certified etc. can you please comment back and let me know .I'am currently trying to find a good dentist for my 6 yr.old daughter who also has Autism and has the shark teeth situation perm teeth growing in back of her baby teeth. Crystrobe7. That is exactly something to do with this blog. I am away from my computer, but I think you are referring to my post on "is yor dentist a pediatric specialist". The link is over there on the right sidebar. If the pediatric dentist is a member of the academy of pediatric dentistry, that is all the better. Board certification is good but is not necessary. Board certification is different with dental specialties vs. Medicine. Hello Dr. B it's me again sorry I did browse the topic you mentioned , but unfortunately it wasn't that particular blog . all I can remember is that you had posted 4 or 5 different questions. that were important to know and ask the dentist before choosing the dentist.maybe it was a response comment to someone.either way what would you recommend someone ask's the dentist before choosing one. I bet that was in the coment section somewhere.. Well, as I mentioned, I would ask if they are a pediatric dentist--a specialist in pediatric dentistry, and any related questions. (My response is mainly about pediatric dentistry, not a general dentist). You could get rather specific and ask where they went to school for their doctorate, then ask where they went to school for their Pediatric residency (might be the same place), but that might not have a direct bearing on the quality of care necessarily. It's interesting to know. You could ask if they do hospital cases (like general anesthesia cases)--if so, at which hospital do they have privileges to do that. Do they have the option of in office sedation of one kind or another if needed. If they are a pediatric dentist, they likely will do both sedations and OR cases, but if your chid does not need that service, it may not be as big a deal. There are a few dentists that choose not to sedate for instance or do OR cases. If it is over a month or two to get a new patient visit, that might indicate they are popular/busy, but so busy you may not always get the first choice of appointment times or have to wait more than you would like. Other than that, you may want to ask around, ask your Pediatrician for a recommendation, or ask your friends who have been in the community a while and have kids too. Word of mouth is our number one source of new patients. Very Good Introduction Dr. Geetha. I appreciate and All the best for your Bright Future.